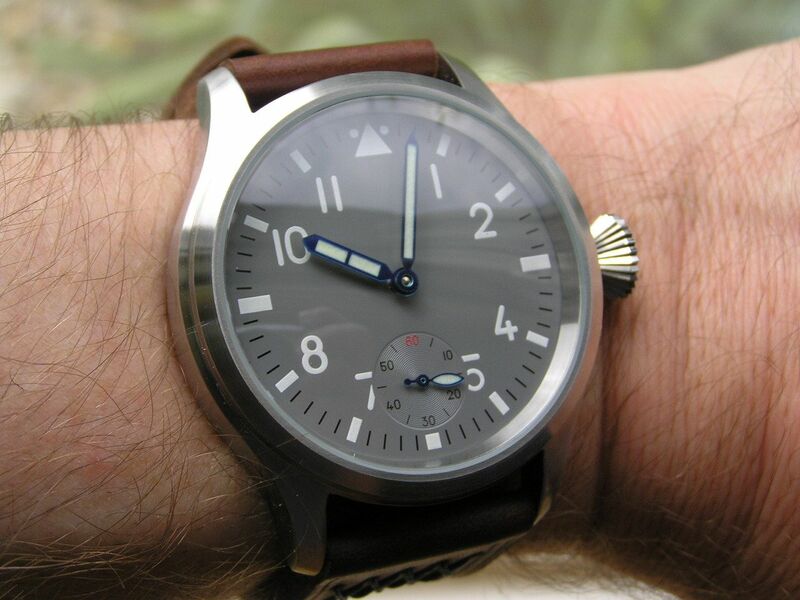 The ‘pilot’ style watch is certainly one of the most popular and ubiquitous types on the market today, with a myriad of variations to choose from: manual wind, automatic, sub seconds, center seconds, different dial colors, case finishes, etc. The choices are almost as endless as are the price points, running from sub-$100 pieces up to $500 or more. 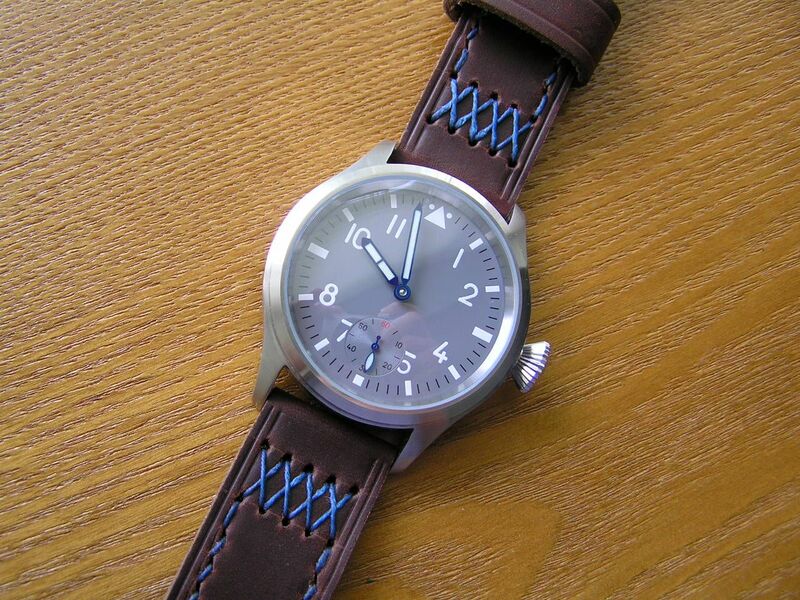 When a fellow WIS turned me onto Getat Watch Company via email, I became intrigued with what Getat was offering. 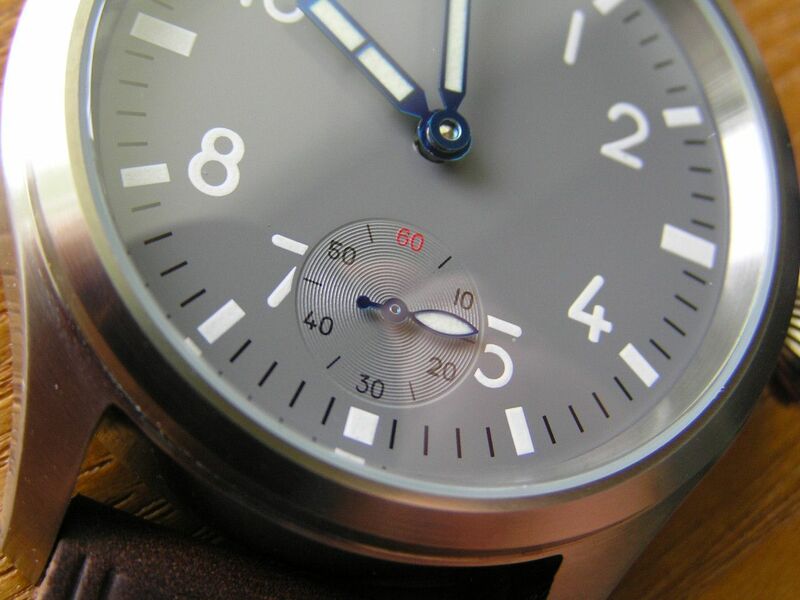 Not only does this enterprising start-up in the Far East offer a good selection of pilot style and other watches, they offer the ability for customers to customize their watches from a menu of options. I love this approach and it was too good for me to pass up, so I took the plunge. I was particularly smitten with the grey dial pilot that Getat offers. 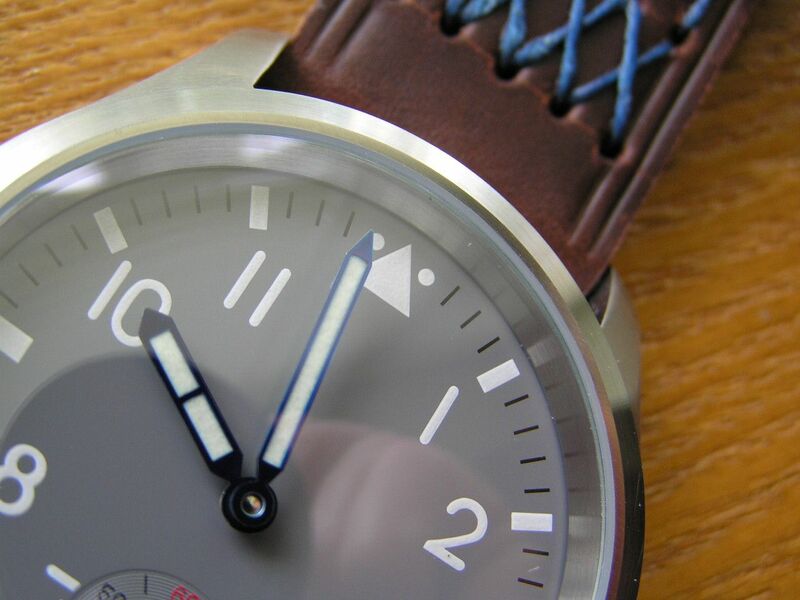 I love grey dials on watches and it certainly isn’t a color you see every day offered on a watch. 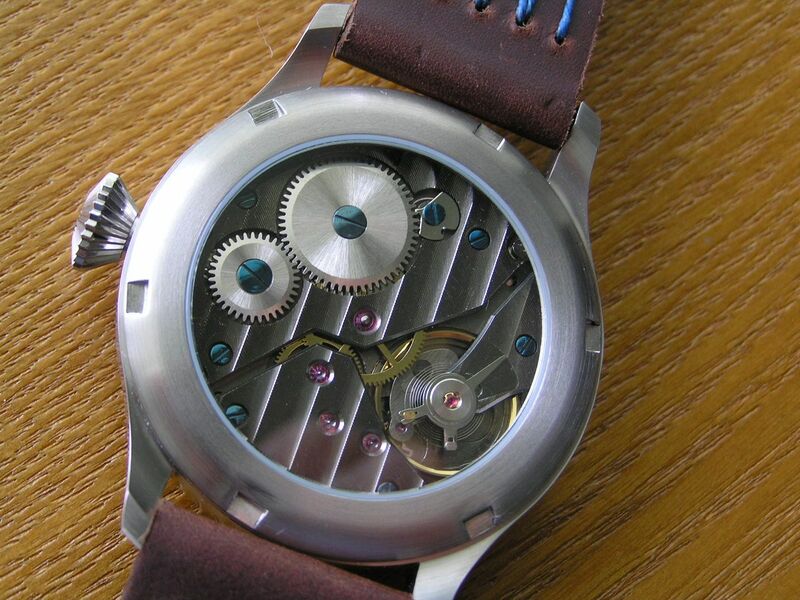 I had the choice from several different movement finishes (standard, PVD/gun metal or skeleton); a 6497 ‘9’ eater or 6498 ‘6’ eater ‘Asian Unitas’ movement; brushed, polished or combination case finish; several handsets to choose from, along with choosing the color of the leather strap, the color of the stitching on the strap and even the stitch style (choice of two). In a word, Nifty! I went with the grey dial 6498 ‘6’ eater with the PVD/gun metal finish, California blue hands, a fully brushed case and a seal brown strap with blue stitching. 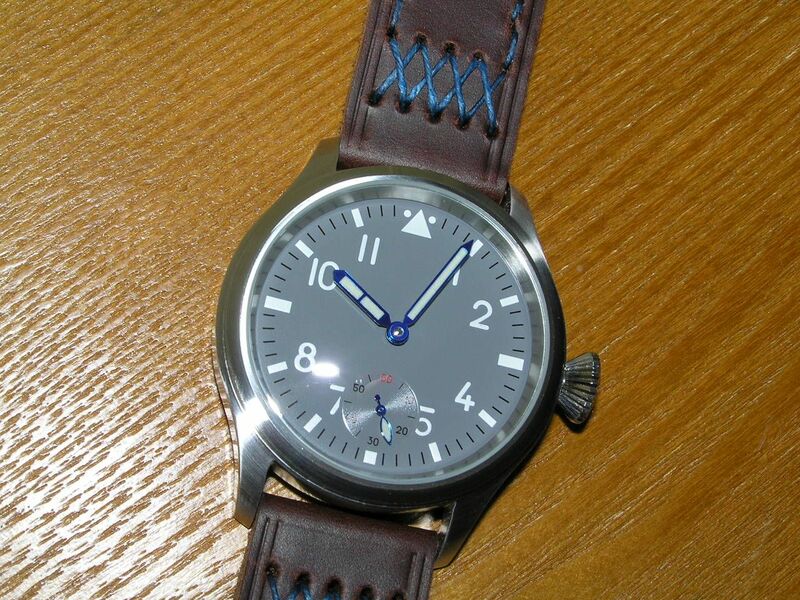 I felt the blue accents on the strap would play off the blue hands, which look great against the grey dial. The blued screws of the movement also help pull this entire color scheme together. The overall fit and finish of this watch is superb, especially for the price point. The build is clean and devoid of dust, dirt, fingerprints, etc. 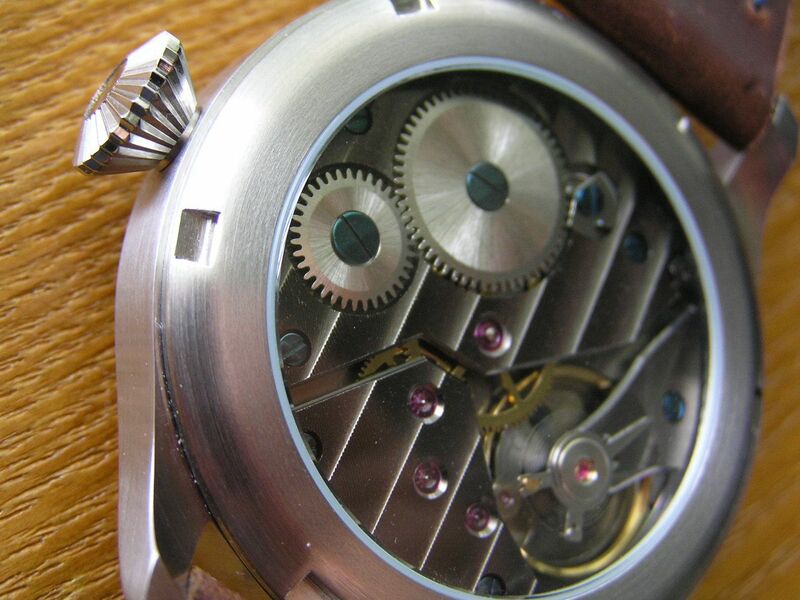 Under an 8x loupe, no glaring defects were noticed, other than a couple of very tiny dots on the dial and one blued screwhead on the movement that could be cleaner. Again, this is entirely in keeping with the price point of this watch and I’ve seen more flaws in watches that cost hundreds of dollars more. 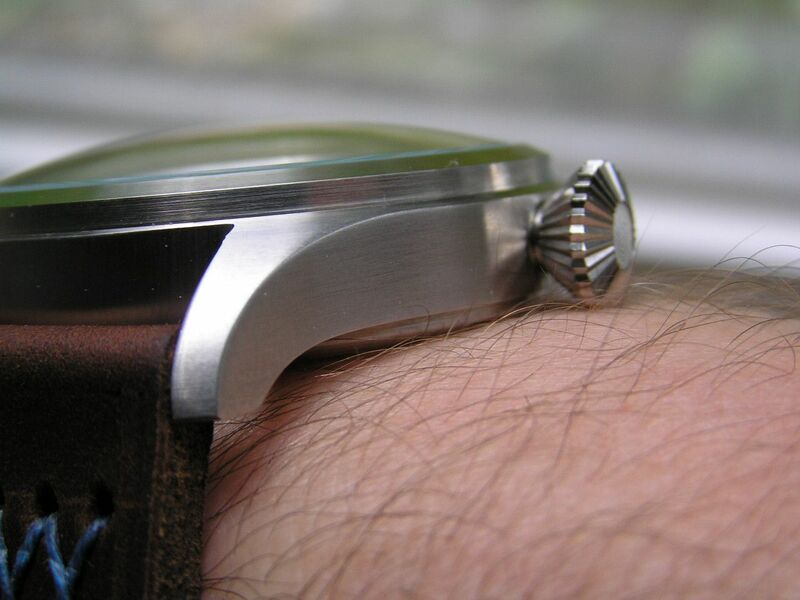 The crown is large, substantial and even screws down, quite a rarity for a manual wind watch. The 17-jewel Asian Unitas movement keeps great time (every watch that Getat sends out is checked for accuracy and timing in six positions before shipment) with a long power reserve of nearly 50 hours on a full wind. Winding action is smooth and consistent and the crown functions perfectly. Over 24 hours, dial up, it runs at -7. 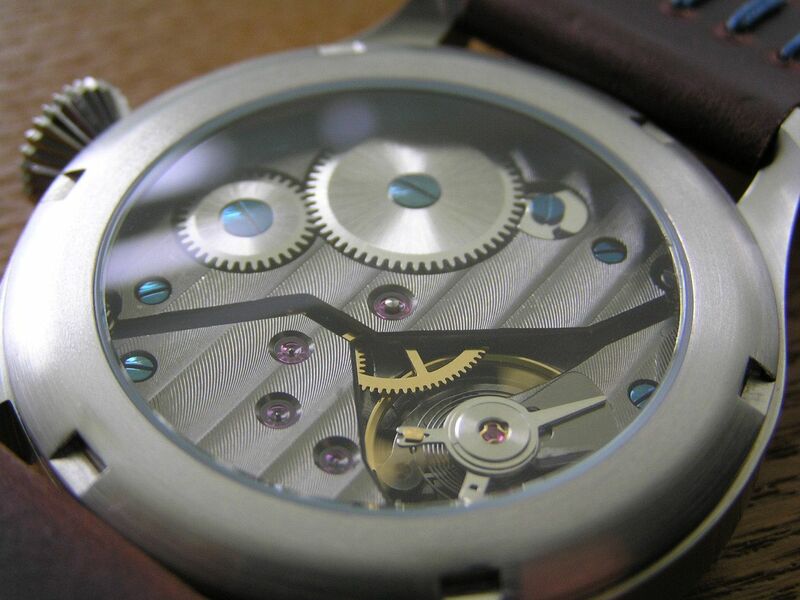 The quality of the finish on the movement is nice and the gun metal finish, in a word, is cool. The skeleton version of the movement is also pretty radical looking, but I felt it wasn’t quite appropriate for this watch. The back is a screw down display type devoid of any markings or printing whatsoever. Ditto for the dial. If you want clean and sterile, this is the watch for you! 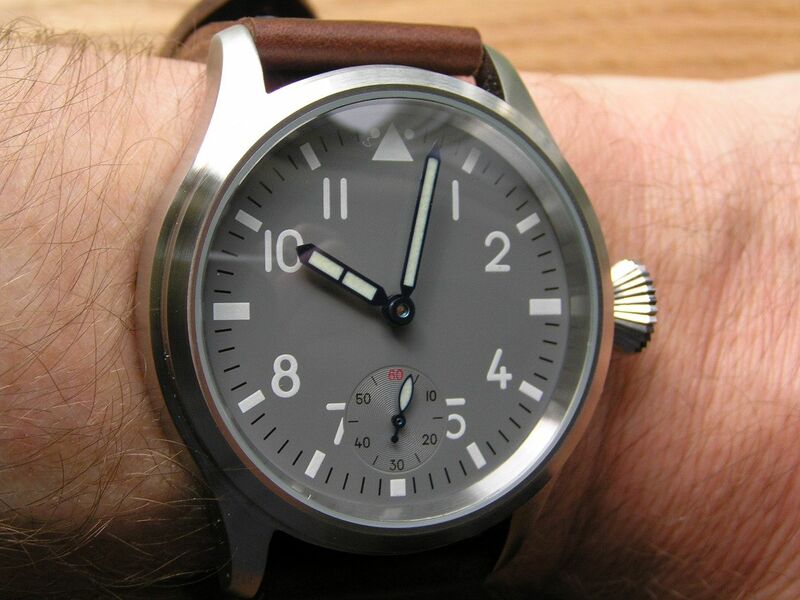 The shade of grey on the dial is perfect, with the subdial @ 6 having a circular pattern to it. The ‘60’ on the subdial is printed in red, all the other markings on the dial are in black or luminous material. 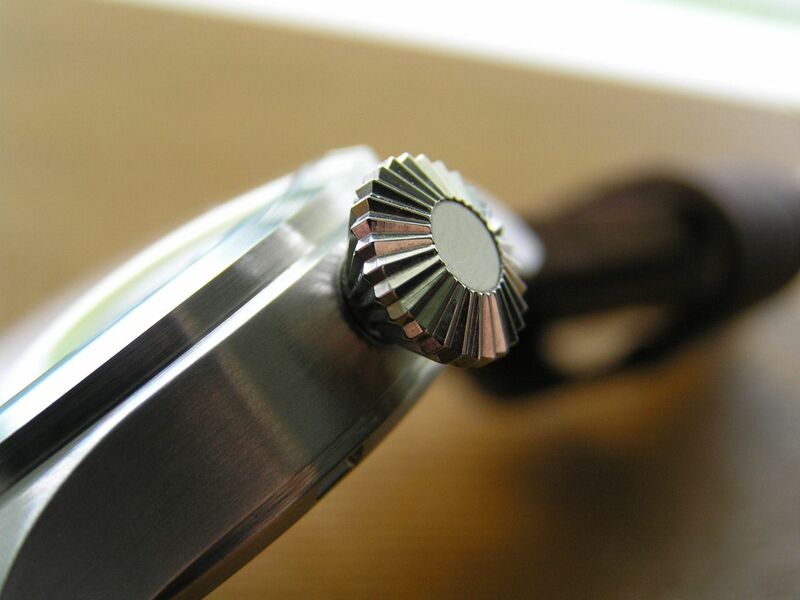 The 316L stainless steel case measures 46.5mm without the diamond-style crown, 51.8mm including the crown. The crown itself measures an impressive 9.5mm in diameter. Lug width is 24mm. Lug-tip to lug-tip is 55.4mm. Case thickness is 14.6mm. The watch has a nice heft to it and a balanced, jewel-like feel. The crystal is a heavy domed mineral, a sapphire upgrade for this model was not offered. I do wish the crystal had some sort of anti-reflective coating on it. 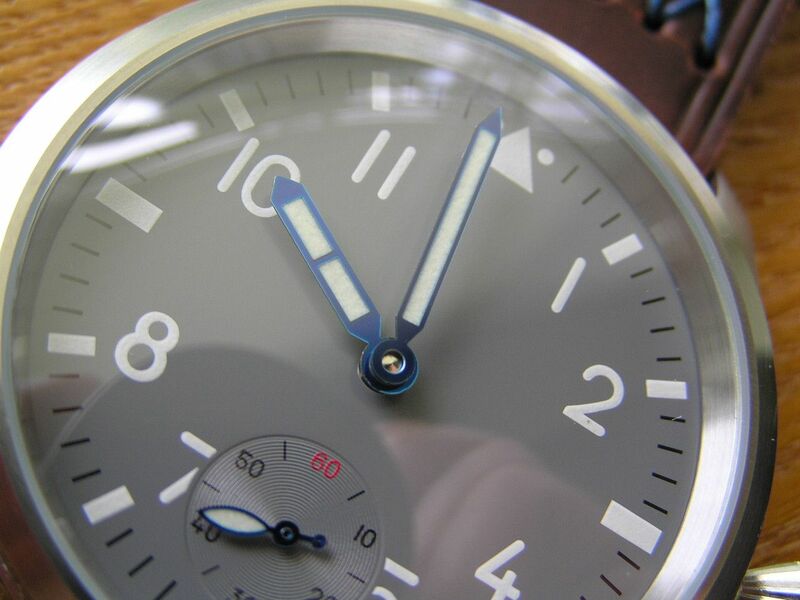 The dial measures 37.6mm with what is referred to as ‘Swiss Superlume’ material. The hand set I chose has what is called ‘Japan Luminous’. 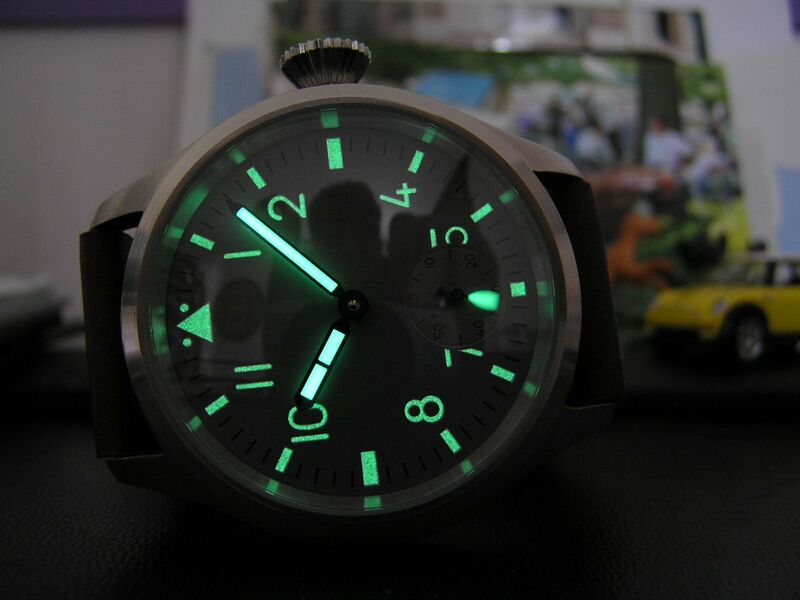 Regardless of where the lume came from, the markers, arabics and hands all glow evenly and brightly. There is no water resistance rating specified for this watch. While it does have a screw down case back and a screw down crown, one would assume there is at least a marginal degree of water resistance, like 5 atm or something. As I don’t get my watches wet, I’m not worried, but to be on the safe side, if you get one, try and keep it dry. 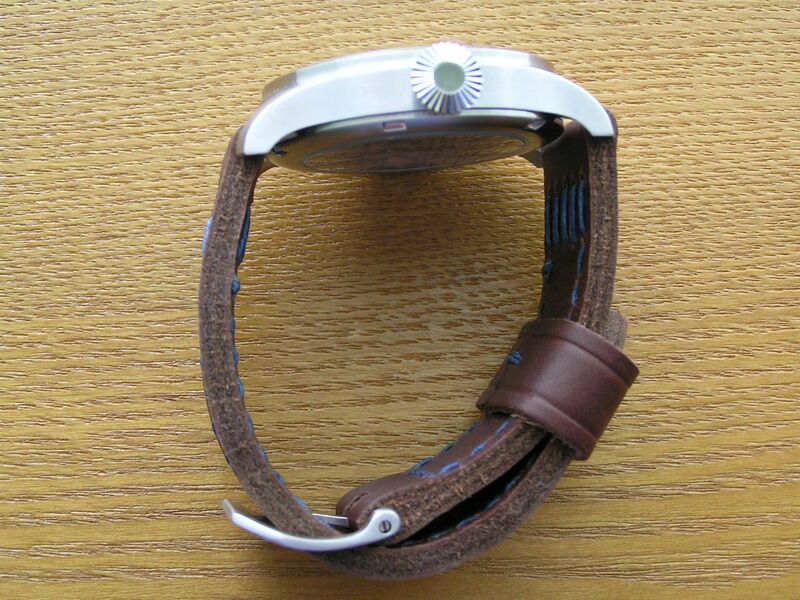 The handmade strap is genuine leather, 4.5mm thick, but fairly flexible. It measures 80/130mm with two oversized floating keepers. I removed one keeper because for me, two were not needed. 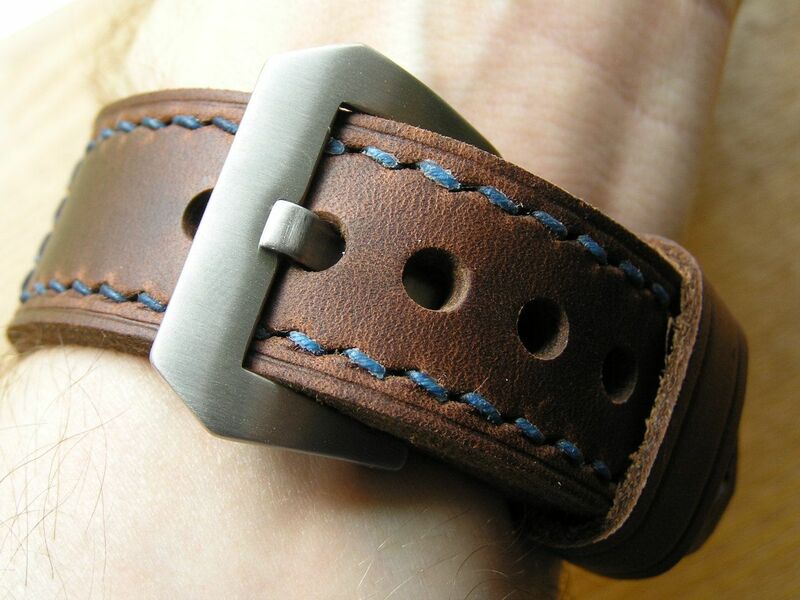 The Pre-V Panny-style buckle is finished to match the case, with my watch, it is brushed. 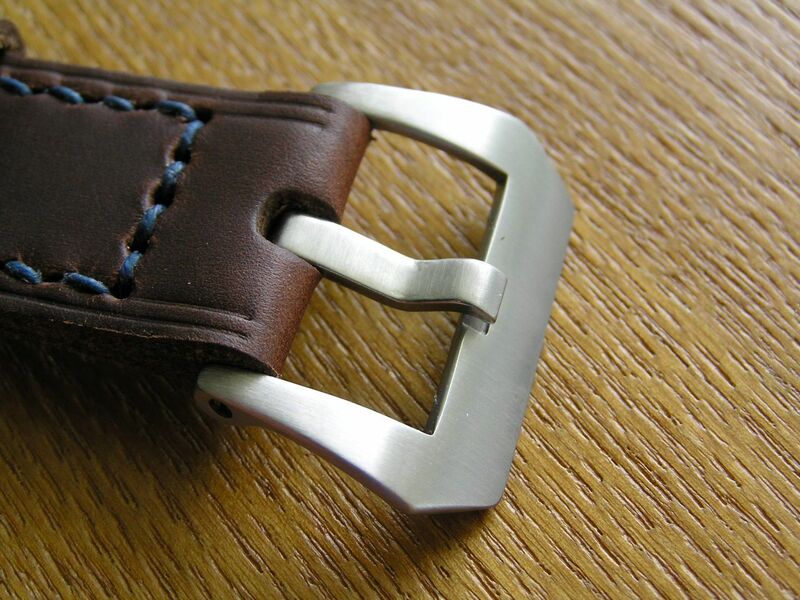 The buckle measures a substantial 35.7mm at its widest point and has a long screw that secures the buckle through the hole in the strap. Getat claims to be using a new strap maker with ‘better hand skill’ especially on the edges. 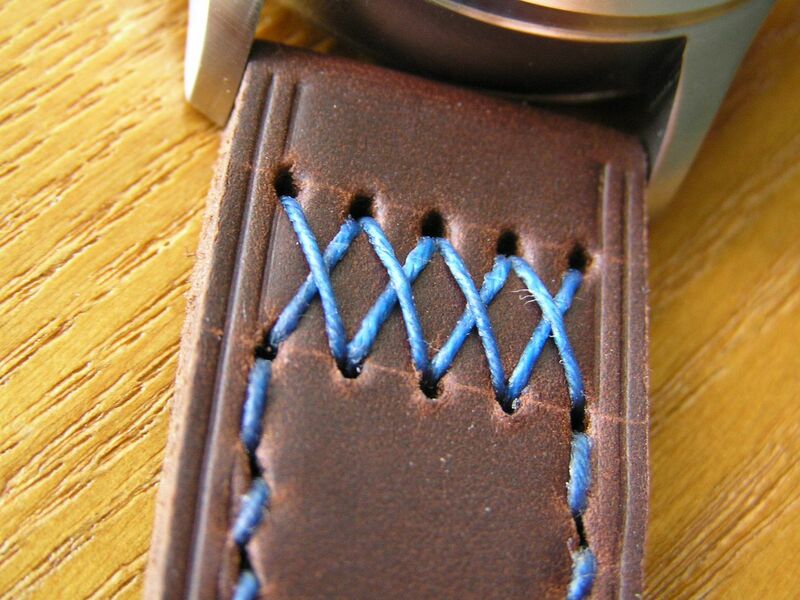 The stitching is robust and is of waxed thread and is available in 12 colors. The watch was shipped in a non-descript padded black box. It would be nice if Getat would supply a fancier wooden box or something that would enhance the special custom order aspect of these watches. I would even pay extra for a plaque stating this watch was custom-crafted for me. Navigating the Getat web site to choose your custom options is fairly straight-forward, but it can be a bit confusing at times as all options are not available with all watch styles. Some options are no-cost selections, such as the case finish, while others are price upgrades, like the PVD finish on the movement. The options are reasonably priced, as my watch fully optioned to my specs and including shipping totaled up to a very affordable $100 USD even. 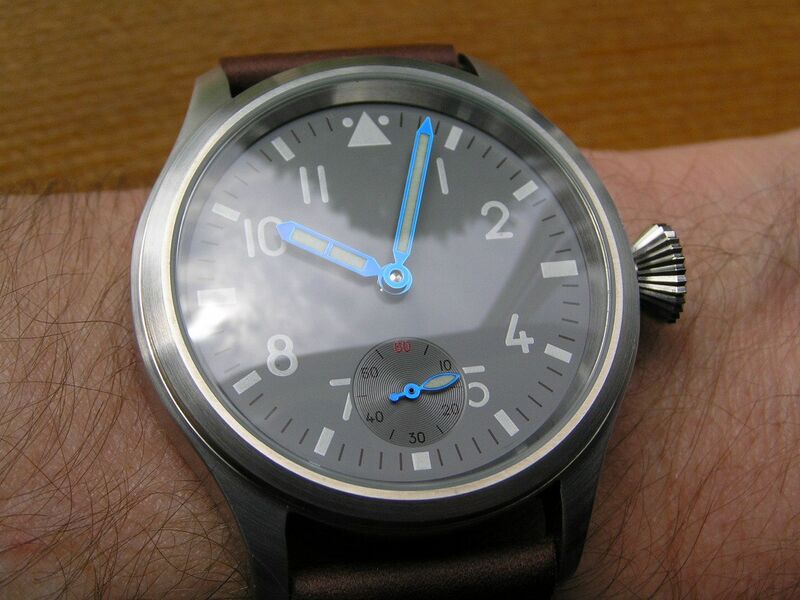 In my opinion, this watch has quality that equals pilot watches costing two to four times as much. A word about Getat the company and Tat, the fellow who runs the place. If you’re in a hurry for a watch and get all antsy when your emails are not answered within five minutes, you probably won’t want to place an order. My watch, after an initial order glitch on Getat’s end, took about four weeks to arrive as well. The watch was shipped with the wrong color strap and I contacted Getat about the error. Tat corrected the problem by sending out the correct strap to me with no questions asked. All emails I ever sent to him were answered accurately and it due time, usually in about two to three days, sometimes a tad longer. I have a feeling he is inundated with orders and is doing his best to keep up. 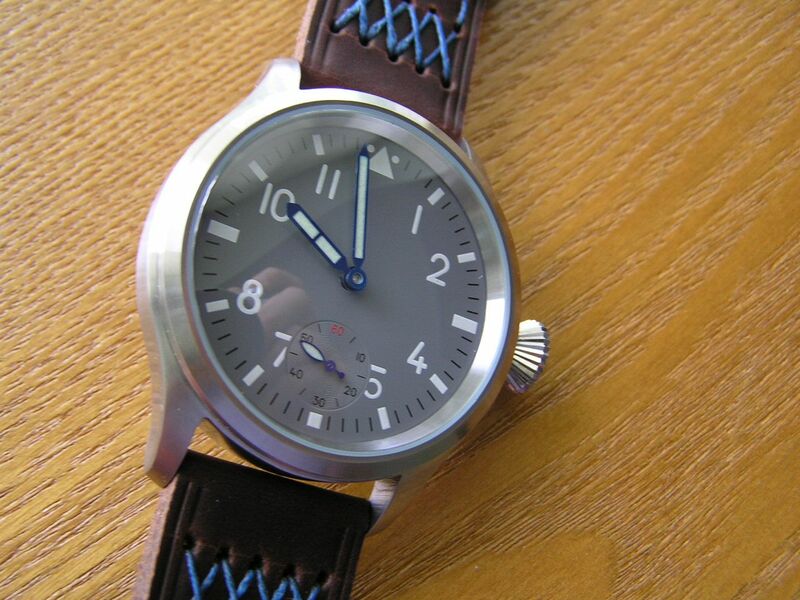 As long as he continues to provide such quality pieces for such great prices, I would be more than willing to wait four or more weeks, especially for a custom-produced watch that is uniquely my own. Cons: a sapphire crystal upgrade would be nice or at least some anti-reflective coating, water resistance rating not specified, presentation nothing special for such a unique piece, watch too sterile for some? 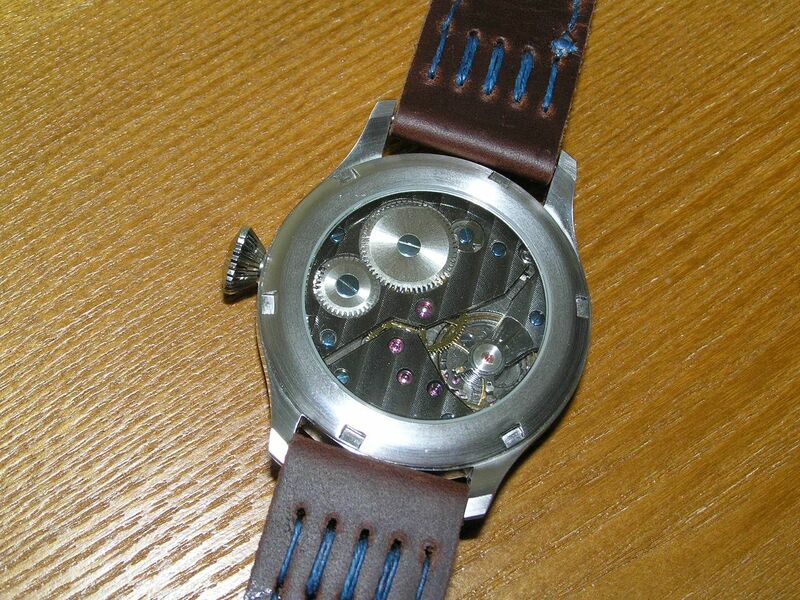 Verdict: great custom watch concept at a very reasonable price, excellent quality and workmanship. 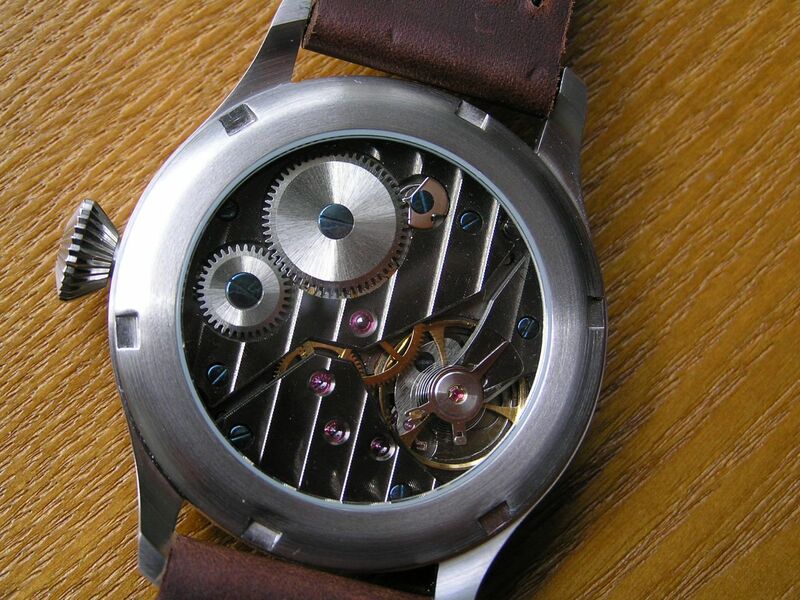 More customization is the future with watches and Getat is helping to lead the way! I really was impressed with my Getat pilot, but I sold it about six months after purchase. The watch is rather large and for some reason, I always seem to sell my Unitas-style 6498 powered watches. In the end, it was perhaps a bit too sterile for me, but the price vs. quality could not be beat. That is a seriously unique and great looking watch! I just started my order process w/Tat on a 47mm luminor. I plan on getting a pilot model as well, but will wait to ensure all is satisfactory on the first order.